KB: I am currently working as a personal trainer and wellness coach in Cleveland, OH, and create online training and nutrtion programs as well. 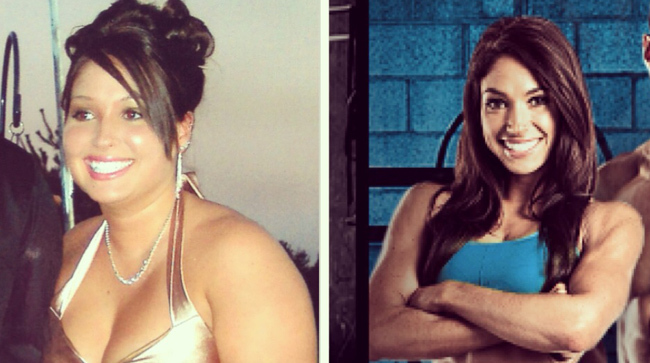 I was featured as one of Bodybuilding.com’s Top 10 Transformations of 2012 after losing 60lbs, and was a finalist in the 2013 Bodyspace Spokesmodel Competition. I am also a fitness model and hold a Bachelor’s degree in Kinesiology from Arizona State University. I hope to one day open my own gym and continue to inspire others to transform their lives just as I have. KB: I played soccer for 13 years, but I would have to say that the “fitness” aspect was my least favorite part. I just enjoyed playing the sport! It wasn’t until shortly before I graduated college that I started to put my health first and really got involved with fitness. I had gained a significant amount of weight throughout college from being inactive and eating unhealthfully. For many people there is a moment when they realize they need to change their habits, whether it be breaking the zipper on their pant or getting out of breath when they walk up the stairs, but I didn’t have a moment like that. I was ignorant to the fact that I was extremely overweight and the last thing I cared about was my health. A couple months before I graduated college, I caught the flu and wasn’t able to keep food down. By the end of the week I had lost a few pounds, and after I had recovered, I liked the way the weight loss looked and felt, so I kept it going. Over the course of 2 ½ years I lost close to 60lbs and completely transformed my body and my life. KB: I would have to say that my personal and fitness lifestyles are not separate. I have made it a point in my life to surround myself with people who are either supportive of my lifestyle or who have similar health and fitness goals to me. I surround myself with positivity and practice everything in moderation so there is no need to find a balance between the two. KB: Right now I’m focusing on putting on a bit more muscle, so I’ve increased my weight and number of sets, and lowered my repetitions. Overall, my approach to training is to do what I love and I make sure to constantly change things up to keep myself interested. I love lifting so I make that the focus of my workouts. I hate cardio so I keep it limited. Its simple… do what you love and you’ll have no problem sticking to it. All of my workouts start with a 10 minute run on the treadmill at 7.5mph and 1% incline. This is the only cardio I do. KB: I just recently switched to a Paleo/Primal style diet to keep help regulate my insulin levels. I’ve found it to be the complete opposite of the typical “bodybuilder” style diet that I have been so accustomed to. A Paleo diet is 100% about health and well-being where a standard bodybuilding diet is 100% about appearance (whether it be bulking up or leaning out). It’s been difficult to make the transition to put the emphasis back on my health and not just appearance, but I have to say its been a nice change! KB: Yes! I think when used properly, supplements can be great tools to “fill the gaps” of any diet or training program. I currently take a multivitamin, fish oil, green tea capsules, a probiotic, BCAAs, and whey protein powder. I periodically will use a pre-workout supplement, but it’s not a staple in my supplement rotation. KB: Knowing how far I’ve come and knowing how many people are motivated by my transformation is enough to keep me motivated for 100 lifetimes! I’ve been on both sides of the coin, and I have to say this side is the clear winner. I feel so much better physically, mentally and emotionally… there is no way I’m ever going back! KB: Legs! Probably the reason why I train them twice a week! I feel strong being able to lift such heavy weight on leg days. I also love seeing the development in my hamstrings! They always seemed to be the one body part that was lacking until recently! KB: Its hard to pick a least favorite since I love to train everything! But if I had to choose one I would say abs! Don’t get me wrong, I love to train my abs, but they are the one body part on me responds almost too well from training. I have to keep my ab training to a minimum or my obliques will get really wide and I lose my waist! KB: Being such a newbie in the world of fitness I have to say I’m proud of everything I’ve accomplished. If you would have told me a few years ago that I would be runner up for Bodybuilding.com’s Spokesmodel Competition, or featured on various health and fitness websites, or doing photo shoots… I would have told you that you were crazy! Its been a whirlwind of a few months, but I wouldn’t change it for the world, and I’m excited to see what my future in the fitness industry holds! TF: What advice can you give to someone looking to start making a change to lifestyle to become a healthier them? KB: There is no one size fits all program. I had no idea what I was doing when I started eating right and working out. I did all of my own research and learned as much as a possibly could about every type of diet and workout program. I tried literally everything until I found what I liked and what worked best for my body. Find what works best for you and most importantly, do what you like. If you are following a workout plan or diet and you’re absolutely miserable, what makes you think you’ll stick with it? You won’t! KB: In a recent YouTube video, I revealed that I struggle with Poly Cystic Ovarian Syndrome (PCOS). I am attempting to control my blood sugar levels by eating a Paleo diet, and so far so good! I am looking at it as an adventure rather than a disability. I always try to stay positive!